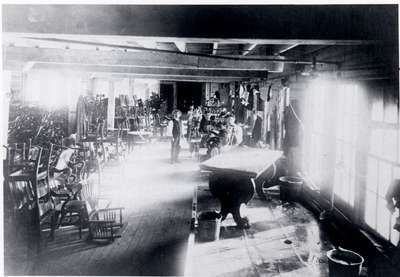 Black and white, interior photograph of H. Krug Furniture Company factory, showing unidentified workers and pieces of furniture being assembled and finished. The H. Krug Furniture Company was located at 111-113 Ahrens Street West, Kitchener, Ontario. Portions of photograph are faded out by bright sunlight. Please see P007079, P007082, P007083, and P007084 for other H. Krug Furniture Company photographs.